Sunday June 14th 1896 We got the work done in time to go down to church early enough to go over to see how Fanny was. We found her some better than yesterday. I got dinner soon as we came from church and we went down to Aunt Ems for a call. Found Seth here when we got back at six oclock. I was tired and went to bed early. Monday June 15th 1896 Will helped me some about washing and churning but he had that pain in his back so he could hardly work. We went down town after dinner to get some things and went to the depot to see Aunt Ems start for Kansas. Came home early to do evening work. Weather warm again. 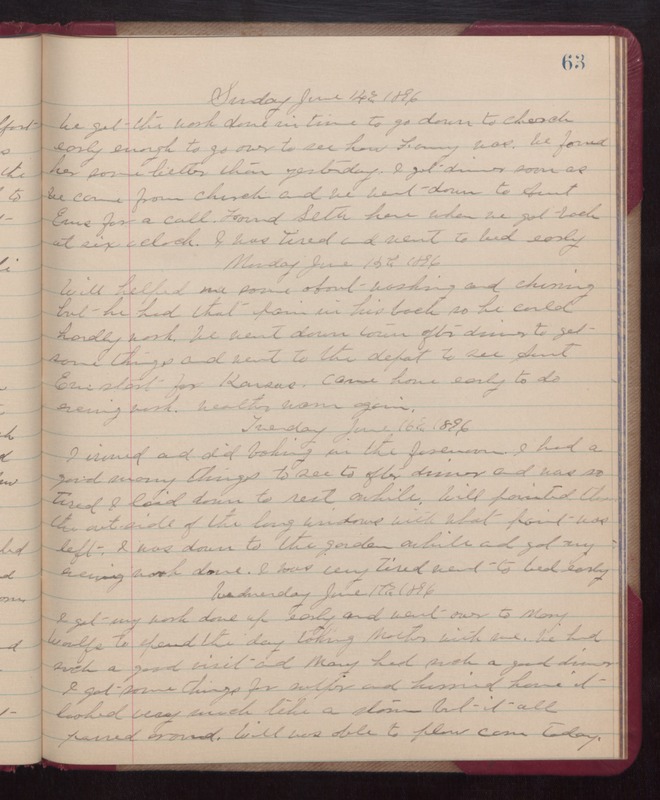 Tuesday June 16th 1896 I ironed and did baking in the forenoon. I had a good many things to see to after dinner and was so tired I laid down to rest awhile. Will painted the outside of the long windows with what paint was left. I was down to the garden awhile and got my evening work done. I was very tired went to bed early. Wednesday June 17th 1896 I got my work down up early and wet over to Mary Woolfs to spend the day taking Mother with me. We had such a good visit and Mary had such a good dinner. i got some things for supper and hurried home, it looked very much like a storm but it all passed around. Will was able to plow corn today.